Back in February, while I was doing what I call “winging it” shopping, I happened upon the “show stopping” Even Thinner Wheat Thins blue package in the cracker aisle. I was so impressed with the package that I wrote a blog post about it. Well it happened again. I was casually walking through the store with a friend and found ourselves randomly walking down the snack chip aisle. There it was – another stop-in-your-tracks package. Once again, in an overwhelmingly yellow segment of the snack cracker aisle, we spotted a single black package with a flaming hot red Triscuit Sriracha emblazoned on the front of the limited edition package – very similar to the limited edition Wheat Thins package. 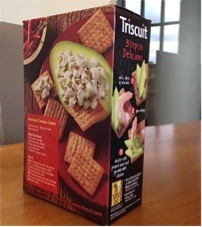 While the Wheat Thins package was extremely clean (no excess decoration) the Triscuit package incorporates subtle design cues supporting the Thai roots of Sriracha, a wonderful hot sauce that I believe originated in Thailand and is used as a condiment on almost any food. I like the very subtle tone-on-tone inclusion of background design flourishes to support the mood and atmosphere surrounding the concept of a Sriracha-flavored cracker leaving Triscuit and Sriracha the hero messages on the package. It was very creative to use what looks like red bird’s eye chilies to create a parenthetical framing of a cracker visual. It says to me that this is a great cracker but it is not for the faint of heart. The side and back panels on the package have recipe and use recommendations that reflect the type of food styling seen in m any contemporary cookbooks. 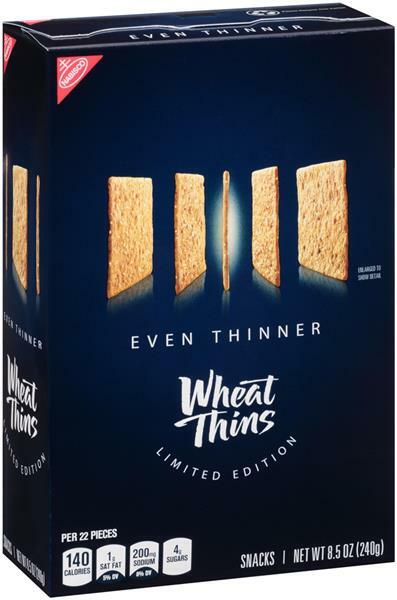 This is different from the Wheat Thins package, where side and back panels were as spare as the face panel and focused only on the thin nature of the product. 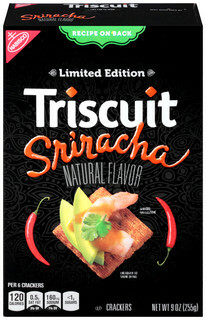 Congratulations to the Triscuit Sriracha design team. The design and execution are well done and do the job of grabbing attention. Taken in total, it is a highly impactful package in an overcrowded segment. But remember, as a limited edition product, it won’t be on shelf forever. I did buy it and I will share it with my friends as a new find!